Summer is quickly winding down. The “End of Summer” blues are kicking in. The few weeks that remain will be a whirlwind of last chance summer jaunts and vacations, BBQ’s with friends and planning our busy fall calendars. Where did the time go? As usual, summer is never long enough. It’s a blur of beach, summer camps for our kids, responsibilities and “no” responsibilities. Despite being summer, we all probably still struggle with finding time to work on self, soul and sanity. Happily though, Pam and I did launch this blog in June and the feedback has been great. We managed to do a variety of things on our “52” list and whether they would be considered “big” or small, spiritual or physical, we’re on our way. The concept — what the the52weeks.com is all about — seems to be hitting a chord with many and we’re happy about that. That’s what our goal was: to get off our asses (and motivate others to do the same) and do some new things, make some changes, take some baby steps. A few weeks ago we put out a “Call to Action” on Facebook to see what things were on other people’s “to-do” lists – and we’re not talking about picking up your laundry! We asked people to share the things that they plan on doing that’s different, new or inspiring this year. So, with the end of summer approaching we thought it was a good time to share some of the responses we have received to date. Also, if you’re like us, fall always seems like a good time to set some goals and get going again – almost more than New Year’s in our opinion. “To-Do” lists (or life lists as we like to call them to differentiate them from lists with mundane chores) have been around for a long time. 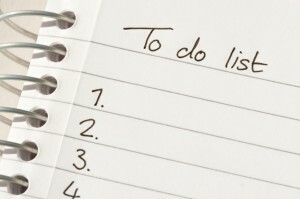 There was a great New York Times article a few years ago that talked about these types of “to-do” lists and how important they were. “The life-list has become widely popular with the harried masses, equal parts motivational self-help and escapist fantasy”. We agree. The article also offers an explanation for the phenomenon and says that it’s the “perfect way for anxious, time-crunched people to embark on spiritual quests in a productivity-obsessed age”. We also didn’t know this but Ellen DeGeneres asked the question on her show a few years ago and found out that Orlando Bloom vowed to learn to play the bongos and that Beyonce promised herself ballet lessons. When we conceived the52weeks.com we didn’t know any of this…it just happened naturally. But, not surprisingly, now we’re finding that the question has been asked before and we’re asking it again via our blog. Hey, we’re hoping Ellen revisits the question, takes a look at the52weeks.com this year and helps us gather more great answers! So as you lay on the beach or plan your fall calendars, take a look at just a few of the responses we received on our Facebook page (facebook/the52weeks.com). They cover the gamut from professional goals to physical to just finding more time or taking a first step. I committed to my first triathlon last evening. Maybe there were too many drinks involved?? I have stopped waiting for the “right” time and filed adoption papers!!! 2010 is a lot of change for me. Moved in April, start a whole new job (teaching pre-school) in September and am getting married in October. I plan to try and do all of this while staying present and not freaking out. I plan on making all my dreams come true. I’m a big believer if you want something and a strong enough willpower you can do anything! Here’s to a very successful year! I’m moving back to FL and losing 15 lbs! Planning on growing Love Our Children USA even more (the charity I founded almost 12 years ago,) selling more fabulous apartments in Manhattan through Halstead where I’m a broker and make more time for a personal life. I hope to finish writing my first book this year, nothing like a deadline to get things going! 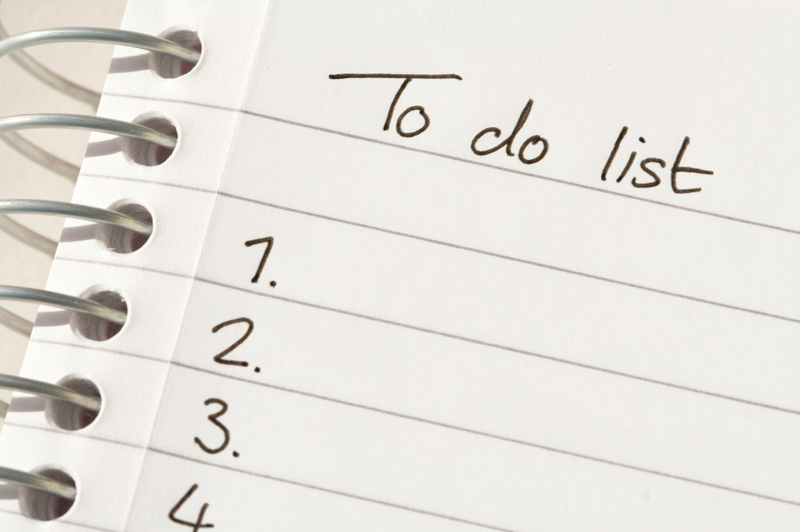 Our research even revealed some imaginative “To-Do” lists from funnyman Jonathan Katz . In his book, entitled To-Do Lists of the Dead he had fun thinking about George Washington , saying Washington would include “checking gums for termites and burying the hatchet” on his list. For FDR he poked fun at a list that would come too late and included “come up with a more upbeat name for the Great Depression”. Funny book. The New York Times, in that same article, states that Jay Gatsby vowed to “practice elocution, poise and how to attain it”! So to sum it all up for now, we took a step back this week and looked at our readers and what they want to do. We wanted to take a moment to enjoy our blog and take time to think about what it is all about. It doesn’t mean we’re getting a pass for one of our “52”; we’re always planning and are gearing up for fall (after a few more great Summer things!). We plan on doubling up one week in September because a commitment is a commitment and we promised ourselves and our readers we’d do it. But this week it was about toasting everyone’s lists. Because the fact is, it’s not just about us.